Roustabout brings 19th-century music to life! The City of Fairfax and Historic Fairfax City present “Fairfax History Day,” a day of living history that offers a taste of what 19th-century life was like for residents of Fairfax, Virginia. 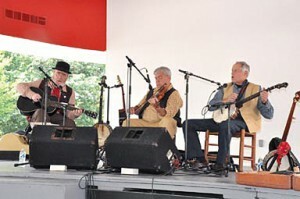 Washington Revels is excited to again present Roustabout String Band (which frequently performs with our Heritage Voices ensemble) in two performances of traditional old-time string music during the event. In addition to the music, hear from guest speakers and authors, tour the historic Blenheim House, enjoy a hayride, and try your hand at period games and pastimes. A wonderful and family-friendly day of learning and fun!